I know you’re hungry for more draft intel. Tired of hearing who the Bills will pick at No. 8? Me too. Rather than dwell on that, here are a few essential reads to get you in the know before the draft. First, Dr. Jene Bramel lays out which players could drop due to concerns about their health. A few top prospects may not go in the first round this year because NFL GMs can’t be sure they’ll return to their peak college form. Next up, feast on some mock drafts from around the Web. We get two perspectives on who will go where via Rotoworld’s dueling mocks. And if that doesn’t wear you out, try on FFToday’s mock draft for size. Follow that up with Bruno Boys’ final mock of Rounds 1 and 2, and I think you’ll have reached your quota. If you’re a history buff, jump into the top 10 picks of all-time by each franchise in the NFL and Pro Football Focus’ look at first round hits and misses. And if reading isn’t your thing…how about we play some bingo? 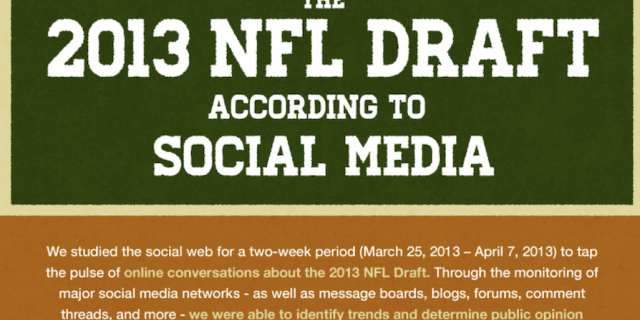 The 2013 NFL Draft kicks off at 7 p.m. CST. See you then. Most mock drafts are nonsense. You can stop reading them. We don’t know any better than the Jaguars do who’s going to take who in the draft. This year, everyone seems to be accepting that, and we didn’t put together a mock draft here at Fools. But they are fun to do, aren’t they? For your entertainment, I offer up Ufford’s take on mock drafts, which I believe gets it right — they’re mostly fan fiction for the people watching at home…hoping desperately that their home team doesn’t screw it up. It’s nice to think for a while that they might do the right thing with that first round pick, isn’t it?